With Warner Bros. re-releasing Zack Snyder’s “Ultimate Cut” of his 2009 Watchmen on Blu-ray this week, the filmmaker spoke with The LA Times about his fondness for comic books in general and offered a brief update on next summer’s Superman reboot, Man of Steel. The film stars Henry Cavill in the role of Superman/Clark Kent, alongside three-time Oscar nominee Amy Adams (The Fighter), Oscar nominee Michael Shannon (Revolutionary Road), Academy Award winner Kevin Costner (Dances with Wolves), Oscar nominee Diane Lane (Unfaithful), Oscar nominee Laurence Fishburne (What’s Love Got to Do with It), Antje Traue, Ayelet Zurer, Christopher Meloni, Harry Lennix, Michael Kelly, Richard Shiff, and Academy Award winner Russell Crowe (Gladiator). Man of Steel is produced by Charles Roven, Emma Thomas, Christopher Nolan and Deborah Snyder. The screenplay was written by David S. Goyer, from a story by Goyer & Nolan, based upon Superman characters created by Jerry Siegel & Joe Shuster and published by DC Entertainment. Thomas Tull, Lloyd Phillips and Jon Peters are the film’s executive producers. 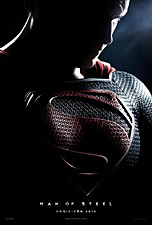 Man of Steel is slated for release on June 14, 2013.